Born in north Africa at Tagaste of Berber parents, Monnica was married to Patricius, a Latinized provincial of Tagaste. By her patient persistence Monnica won over her husband, who was baptized the year before he died. By Patricius, Monnica was the mother of three children: Augustine, Navigius, and Perpetus. She is especially venerated as the mother of Augustine, later bishop of Hippo, and in her patient treatment of him through many years of anxiety ending in his conversion, she is seen as the model of Christian motherhood. Most of our information about Monnica comes from Book IX of Augustine’s Confessions. We learn that that when he was young, Monnica enrolled him as a catechumen according to the custom of the day, but his dissolute life caused her so much distress that at one time she refused to allow him to live in her house. Advised by a presbyter of the Church that the time for his conversion had not yet come, she relented and gave up arguing with him, turning instead to prayer, fasts, and vigils, hoping that these would succeed where argument had failed. Eventually Augustine went to Rome, deceiving his mother about the time of his departure in order to travel without her. He went on from Rome to Milan, but Monnica followed him. She was esteemed by Ambrose, the bishop of that city, who also helped Augustine towards conversion to Christ and a deep moral transformation, which took place in 386. As a consequence, Augustine renounced his mother’s plans for his marriage, determining to remain celibate, and with his mother and a few close friends he withdrew for a period to prepare for baptism. Augustine was baptized in 387. Monnica and his friends set out on the jounrey to Africa with him, but she died along the way, at Ostia, where she was buried. Modern excavations at Ostia uncovered her original tomb, but her mortal remains were transferred in 1430 to the Church of Saint Augustine in Rome. O Lord, through spiritual discipline you strengthened your servant Monnica to persevere in offering her love and prayers and tears for the conversion of her husband and of Augustine their son: Deepen our devotion, we pray, and use us in accordance with your will to bring others, even our own kindred, to acknowledge Jesus Christ as Savior and Lord; who with you and the Holy Spirit lives and reigns, one God, for ever and ever. Amen. 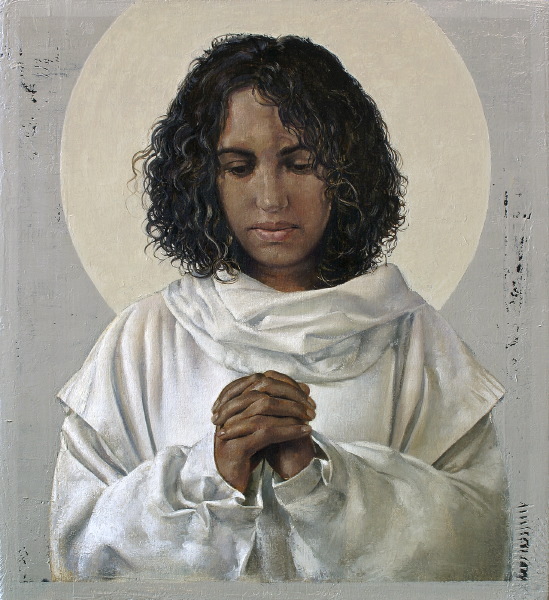 The image of Monnica is from Saint Monica’s Church in the Diocese of Trenton, from a study of the saint done by John Nava, the artist who created the stunning tapestries in the Cathedral of Our Lady of the Angels in Los Angeles. Saint Monnica is also depicted in one of the tapestry panels. The propers for the commemoration of Monnica, Widow and Mother of Augustine of Hippo, are published on the Lectionary Page website.